December 2014 | ivy eats again. "Udon is a type of thick wheat flour noodle of Japanese cuisine" (from Wikipedia). 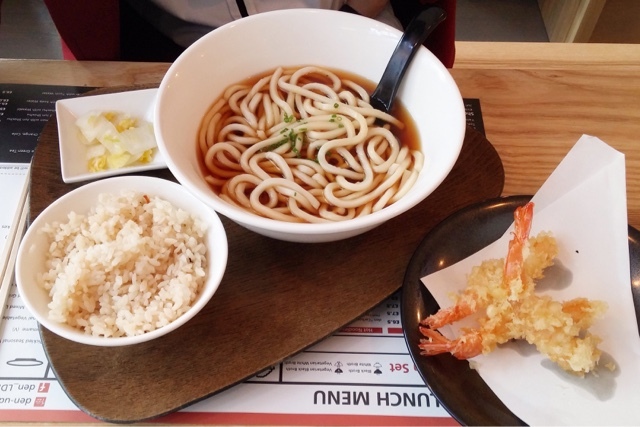 Den is a new restaurant specialising in udon situated on Acton Street at King's Cross. 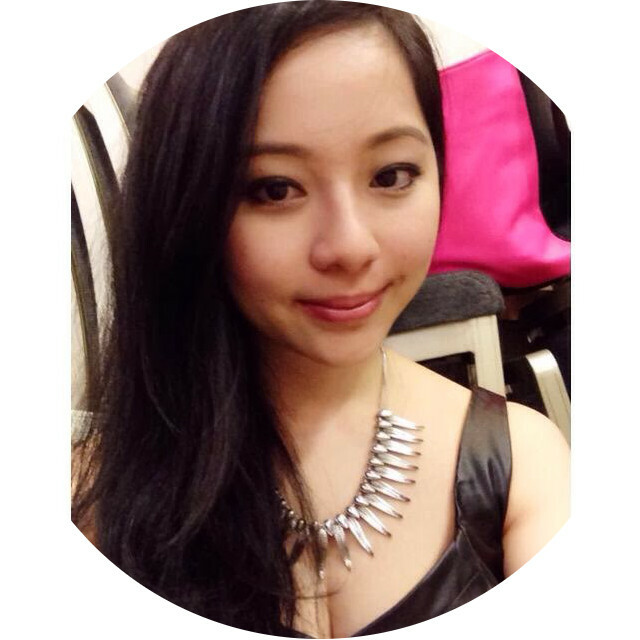 Emi Machida is the head chef and have previously worked in Koya and Bone Daddies. If you have been to Koya before, you should be familiar with its silky udon noodles made in house. 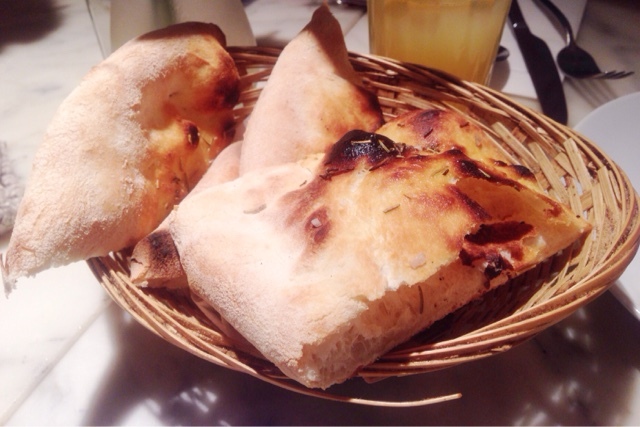 With high expectation, I went to the soft launch during one Saturday's lunch time. With an old pub façade, it is easy to miss the place and no sign yet. Looking into the large window, immediately the clean minimalist design will draw you in. Long communal tables, oversized pendant light bulbs, the light and airy feel gives you a sense of modern Japan. 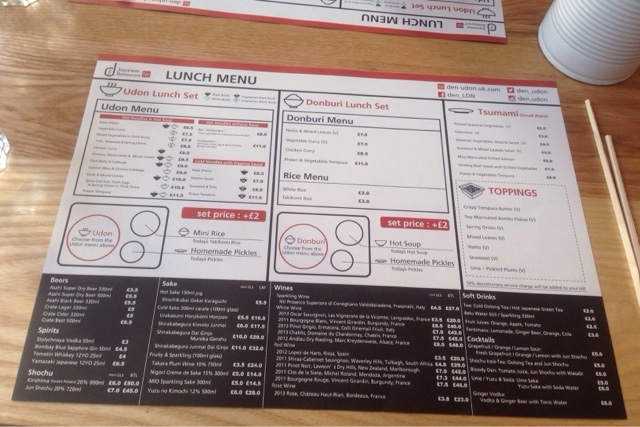 The menu is split into three section, udon, donburi (rice bowl dish) and small plates. 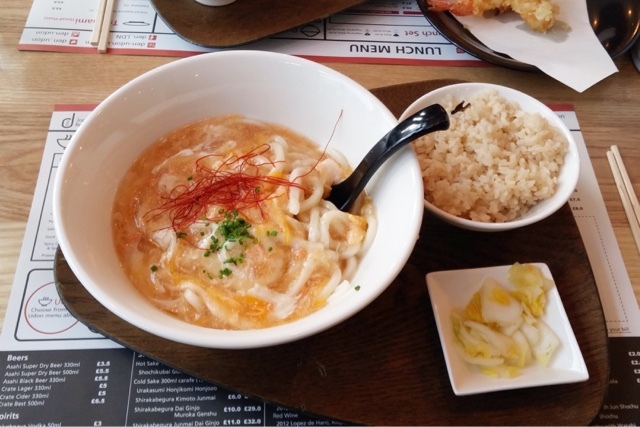 The main focus is udon here, with choices of hot soup, without soup or with dipping sauce. 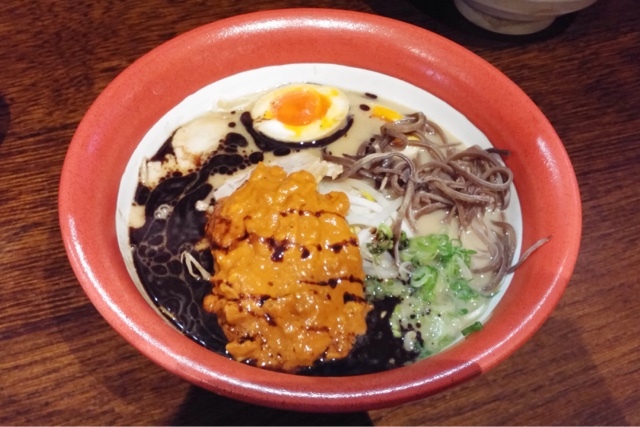 You can also choose the type of hot soups, between light white broth (made of dashi) and a darker, soy-infused black broth (essentially dashi with added soy sauce). Alternative vegetarian-friendly options are available too. For a bit extra, you can add rice and pickles as a set. I don't know what I was expecting, spicy cod roe udon was strange. It came in as a thick gravy made by thickening the light broth. It was more of a sauce than a soup. The udon is good, it's not the best but I feel like there's something missing. I didn't have the silky texture that you get with freshly made udon or it could have been the sauce covering that texture. Either way, I didn't really like it. Mr T had the prawn tempura set. Tempura was light and crispy but the prawn was tiny. The black broth was good but he didn't think it tasted authentic, the umami was missing. We both went extra for the set, the takikomi rice of the day was shiitake mushroom. 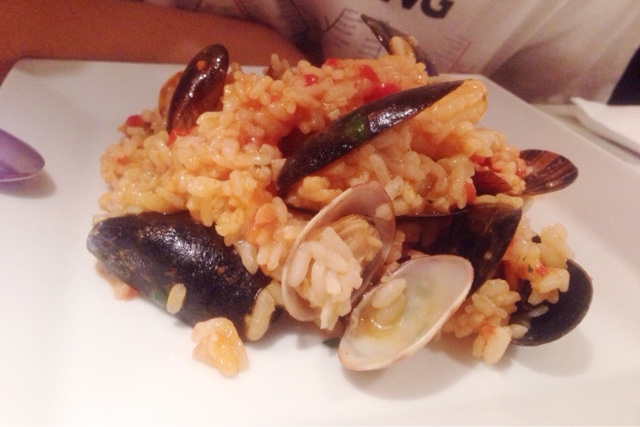 It's a Japanese rice dish cooked with dashi and soy sauce along with mushrooms, vegetables, meat or fish. The flavour was very mild, it wasn't until the third or forth mouthful that you get the shiitake mushroom aftertaste. The pickle of the day was chinese cabbage. It wasn't overly tangy and still had a crunch to it. The udon wasn't filling enough for Mr T so he ordered a salmon. 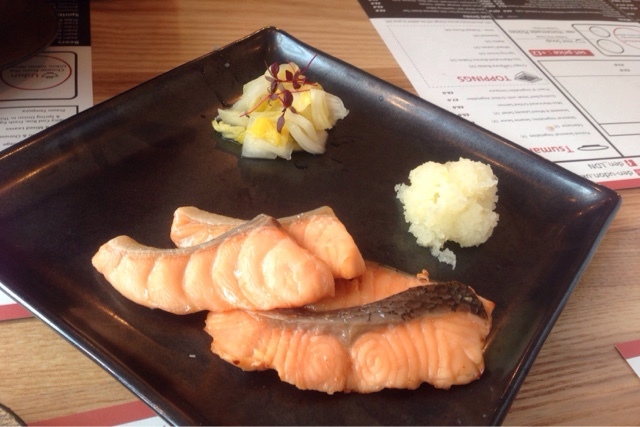 The salmon can be easily forgetten, couldn't taste the miso and the grated daikon did not go with it. The udon can do better, a lot better than what they can offer now. Their dinner menu is more exciting than the lunch menu, I may go there next time for dinner rather lunch. It's still a while before they can come on par with Koya, for the price it's not expensive and best of all no queue. Grabbing a quick evening meal before attending a concert at Barbican wasn't easy. First, there's not much around Barbican beside their in-house restaurant. Secondly, you may run short of time finishing the meal so you end up trying to stuff your face. Not a pleasant sight. Thirdly, you need time to digest and to take a short walk to Barbican. 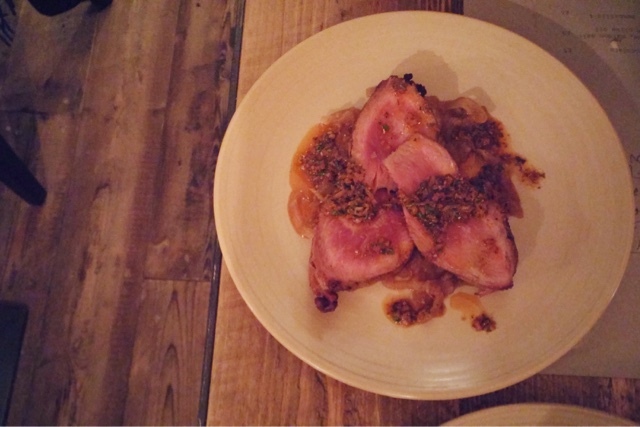 Comptoir Gascon is a small French bistro on Charterhouse Street, opposite Smithfield market. Part of the gastronomical Gascon group including Michelin starred Club Gascon and bar Celler Gascon with a strong focus of food from Gascony. Think duck, foie gras and truffle. Evening service starts at 6:30pm, so we were under huge time constraint. 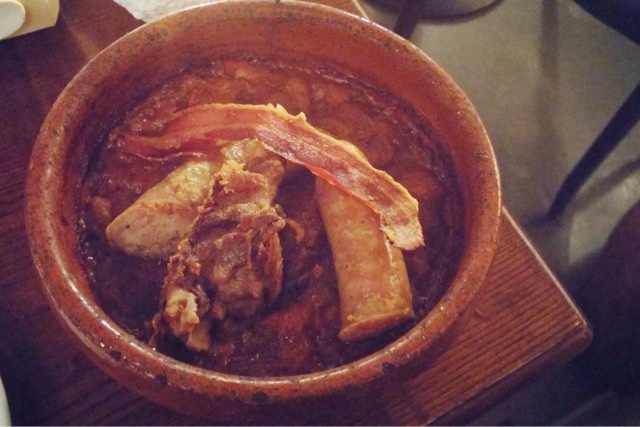 I placed my order of cassoulet the minute I sat down so the kitchen will have enough time to cook it. Me and Mr T shared a starter of piggy treats (loved the name), a platter of pig made in various way of pressed, cured and sliced. 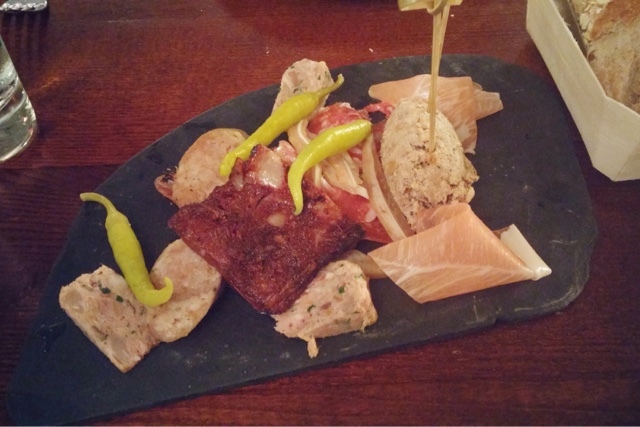 Obviously Gascon took great care of choosing the charcuterie, it was outstanding particularly the blood sausage. Bread does not come with the treats and it felt like something is missing just eating so much salty meats. The platter is definitely enough for two people to share. Mr T eyes sparkled when he saw foie gras and truffle on the menu. It's not hard to guess what he ordered, duck burger deluxe and I went for the traditional cassoulet. Our mains was served before we even finished our starter but because we were in a rush we had to gob down the food. 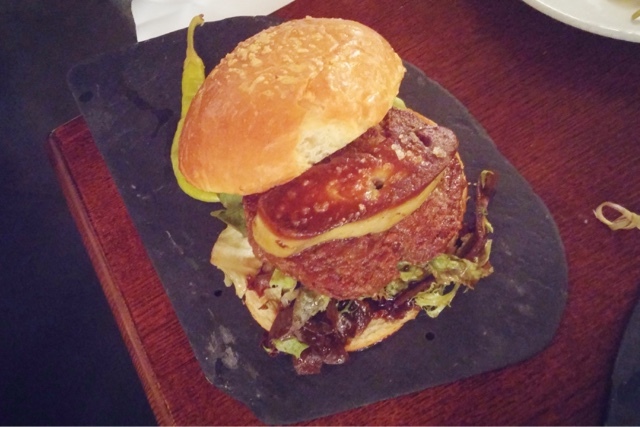 The duck burger deluxe had a slab of perfectly cooked foie gras stacked on top of a duck confit patty. In the word of Mr T: it's not the best burger but the foie gras made up for it. 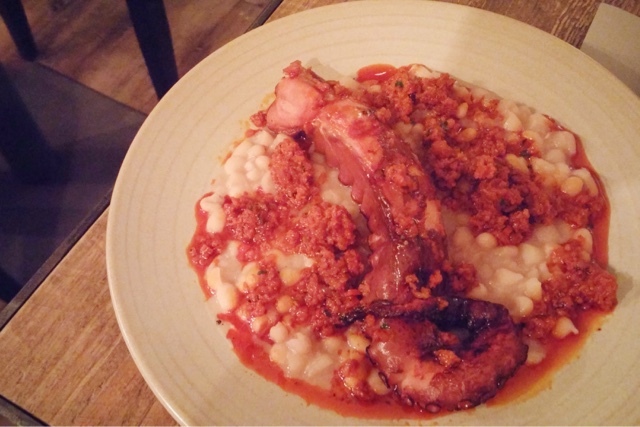 My cassoulet was wonderful, a leg of duck confit and Toulouse sausages protruding from the stew of white beans. A strip of ridiculously crispy bacon on top. The amount of meats may have you set for a heart attack but i was one little happy girl. Two sides also came leaving no room on the table, French fries cooked in duck fat and crazy salt was far from crispy and looking lifeless. Chicory, blue cheese and walnut salad (no photo) had good cripsy chicory not bitter and not over powering blue cheese. The portion size for side orders was huge, more than enough for two people. At this point, dessert could not be consumed. Firstly we were short of time and secondly we were too full. 45 minutes is definitely not enough time to enjoy the brilliance of food. With a wine list focused on Southwest France, our carafe of vin de pays was execellent and very good value at just over £10. 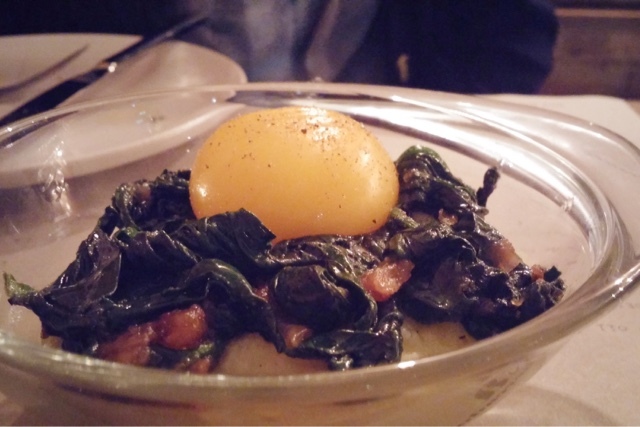 To find an authentic regional French Bistro with such affection to food is brilliant. Rustic décor, informal ambience and friendly causal service. What's not to like as they say? "Douceur de vivre". Another ramen joint poping up, this time it is Bone Daddies from Soho opening up inside Wholefoods market in Kensington. If you want to avoid the queue at the Soho branch, go Kensington. What's more, you can browse around Wholefoods after the meal and stock up on even more food. Menu with interesting choice of starters and ramen. But we were here for one thing which was Tonkotsu, the big bowls of soup thickly laden with bits and bobs. To avoid the messiness of hair dipping into your food and any splashes of broth, how kindly of them to provide hair bands and plastic bibs. I was a bit disappointed that the hirata bun was not on the menu but nevertheless we enjoyed the yellowtail sashimi for starter. 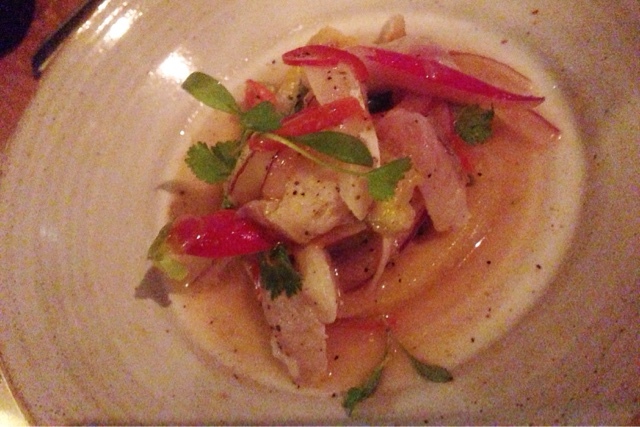 It was fresh and zingy from the ponzu dressing with a hint of heat from the fresh chillis. 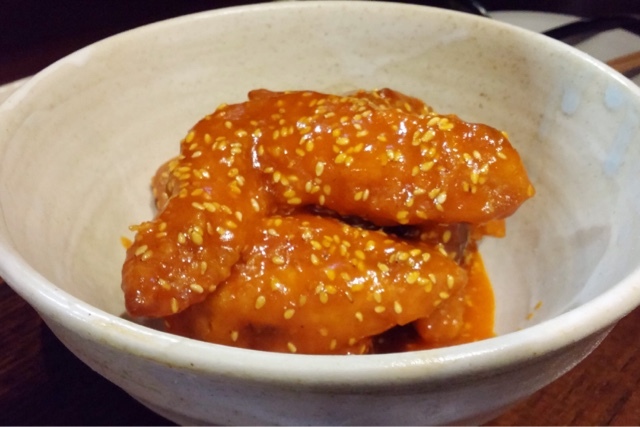 If you are Asian, you may have heard of the over popularised Korean drama "My Love from the Star" which brought in a craze of Korean style fried chicken and beer. It spread throughout East Asian at the beginning of 2014 with news broadcasting about people eating and drinking excessively and ended up in hospital (word of advice: unhealthy to do it excessively). Anyhow, never had the chance to try the Korean style fried chicken wings until now, I liked it but Mr T found it a bit too sour. 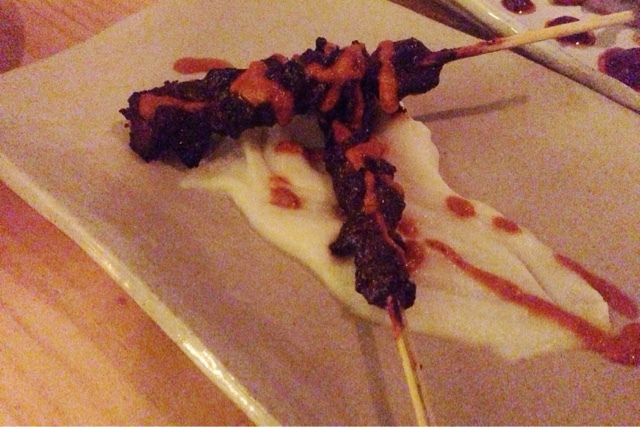 I liked the kick of spiciness from the gochujang sauce and the wings was crispy and moist. The only thing that let it down was the wings was swimming in a paddle of sauce, it just did not need that extra ladle of sauce. I ordered the IP Tonkotsu Ramen consisted of IP sauce, chashu pork, wood ear mushrooms and spring onion with extra egg and beansprouts where as Mr T went for the traditional Tonkotsu Ramen. I don't know what IP sauce is, according to waiter it is a spicy sauce. Was it spicy? Not really, it's a strange sauce that I can't find words to describe. It's nice but I would prefered it without the IP sauce. The Tonkotsu broth is good, it's rich but not the creaminess I was hoping for and the ramen was a bit soft for my liking. The dash of black sesame oil adds another layer of nutty flavour. The egg is runny and not over layered with beansprouts or spring onion. The chashu pork was tender but bland and I don't remember what cut they used but it was on the lean side missing the fattiness that the chashu pork needs. 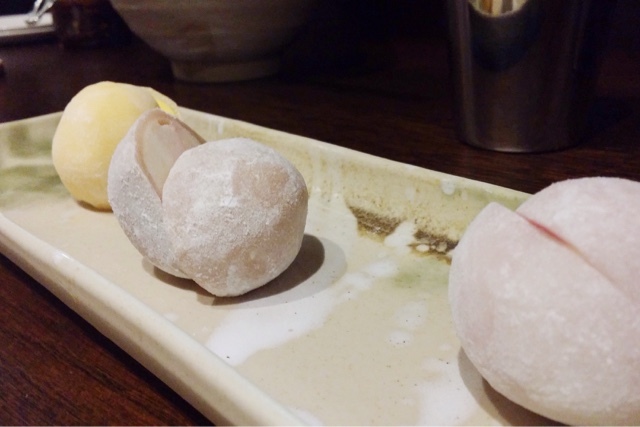 We didn't order dessert, we haven't even finished the ramen yet and was served twice the mochi ice cream mistakenly. The chef offered us the dessert as compliment. I was surprised Mr T never had mochi ice cream despite growing up in Hong Kong. It was all kids' favourite and wishing mum would buy it every time she went to the supermarket. Flavoured ice cream covered in a sticky pounded rice cake mochi. I love mochi and still do now, the chewy texture with some sort of fillings or covered in peanuts and sugar. We had flavours of mango, chocolate and raspberry. Oh gosh, it was cold in the mouth. 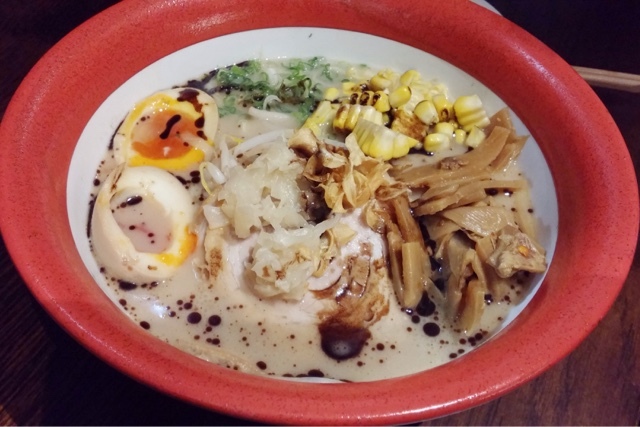 Bone daddies does ramen with creative elements not just traditional taste. For tonkotsu ramen, it is second to Kanada-Ya. 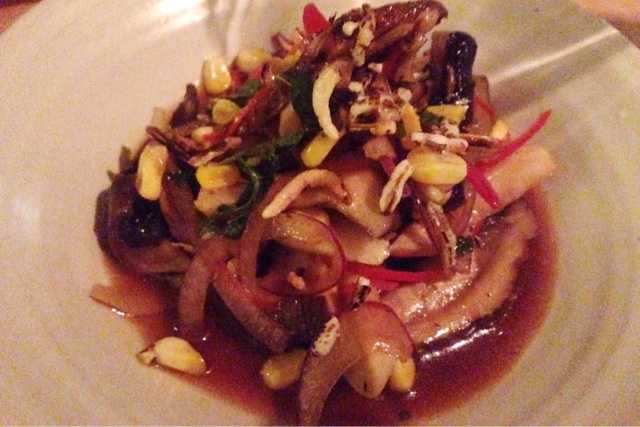 But if you want more than just ramen, bone daddies will not disappoint you. Before leaving, don't forget your shopping from Wholefoods. Dining out at new restaurants are risky, you don't know what the food will be like (most likely there will not be a menu online) and the service may not be up to your standard. There has been many hit and miss times, where the food was good but the service wasn't and vice versa. I don't expect new openings to be perfect and it does take at least couple months before it gets into the flow. Copita Del Mercado popped up in my email for soft launch, I wasn't interested for a booking originally. We couldn't have the time slot that we wanted for the place that we wanted to dine. So I sugguested to Mr T to go for Copita Del Mercado. 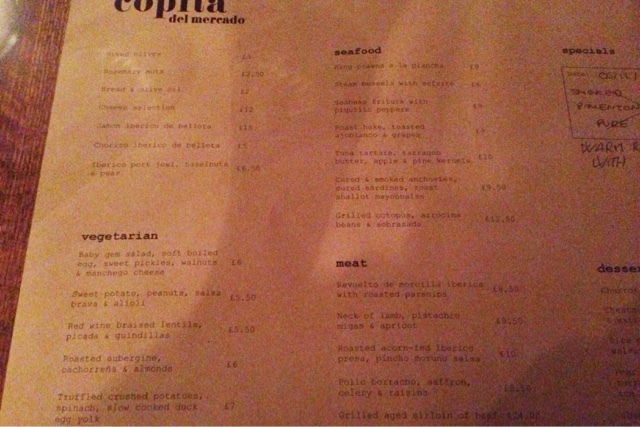 Copita Del Mercado is the offspring to the Copita restaurant in Soho. 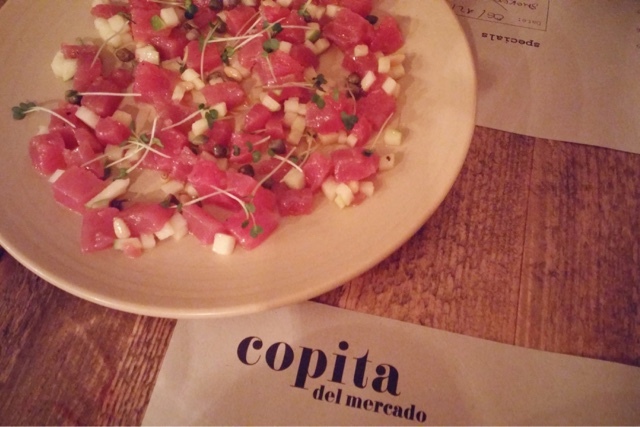 The original Copita is a huge success, listed in the Michelin Guide having obtained a Bib Gourmand in 2013. I only knew about Copita after some research for the blog, it has good reviews offering good tapas food at moderate prices. The new Copita promises to serve larger portions than the original Copita, steering slightly away from the original tapas concept. It's not the easiest restaurant to find especially when it does not have a sign yet. So we stood outside staring not knowing if we made it at the right place or not. The menu does stay true to the root of Spain, it is small but to the disappointment they ran out of "Ox Tongue" special already for the evening service and it was replaced with a warm vegetables salad. We were there around 7:15pm and there was only one other table at the time before it started getting busy. 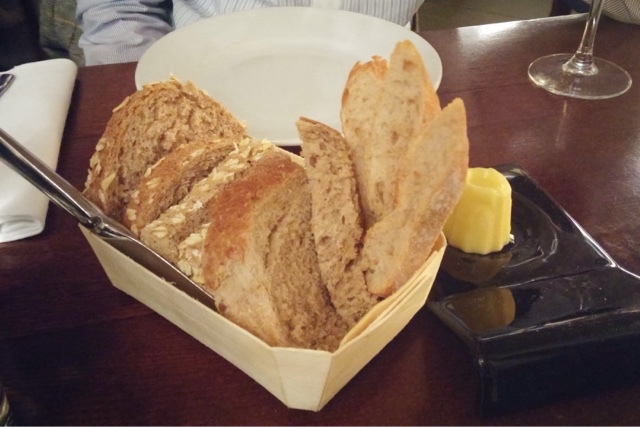 I always order bread for nibble when it is available. 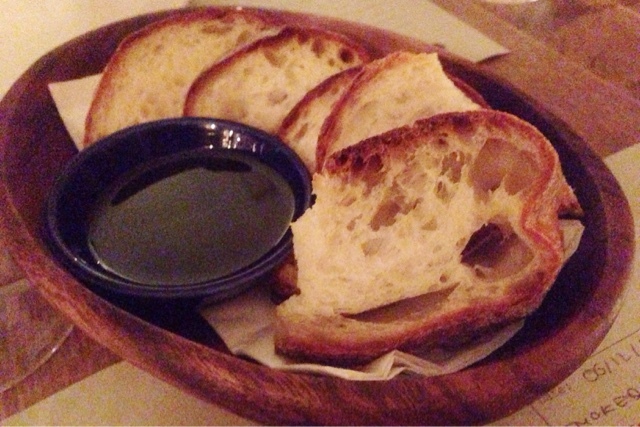 You can judge how good a restaurant is by their bread and it was a miss. It was cold and on the edge of going dry as it was left out too long. It had all the quality of being the perfect bread if it wasn't left out for I don't know how long. The waitress seems very confused when we asked her for a suggestion of wine. She said they had a wine tasting before opening and there was this one that she particularly liked which unfortunately she couldn't locate on the wine list. We ended up with a carafe of Pinot Noir, to Mr T description it tasted vinegary and just about to cross the line of awful. The tuna tartare was not bad, I liked the texture of the soft tuna against the crunchy apple giving the dish a good dimension. Mr T thought the tuna was a bit too lean, could have used a more fattier tuna. Giving the name of crushed potatoes, who would have thought it came in the confusing form of grainy mash potatoes. Beside that it was unbelievably deliciously good, the taste of the truffle in the potatoes lingers in your mouth for a long time. Thanks to Mr T, just a blink of an eye he ate it all. Rest of the meal went downhill, it wasn't memorable. I misread fritura as fritter so I was surprised to see a whole fillet of seabass deep fried instead of the seabass sliced and deep fried. 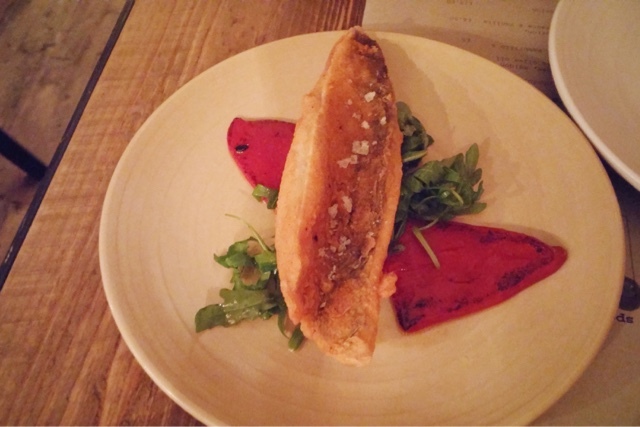 The seabass was coated lightly and did not feel greasy but this whole dish lacked something, a sauce as it felt a bit dried; even an aïoli would have accompanied nicely. The octopus was cooked beautifully, weirdly it had a Chinese taste to it and till now I still can't describe that Chinese taste; I thought long and hard but cannot recall that Chinese dish. I remembered watching Masterchef Professional recently and Marcus Wareing said sous-vide cooking doesn't always work, sometime you have to stay true to classical cooking. 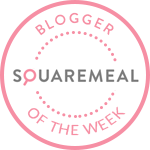 He is indeed right this time, as much as sous-vide can keep a piece of meat moist and tender, it loses the flavour of the meat. This is what happened to the lamb and the iberico presa (presa is a fantastic cut at the end of the pork loin next to the neck), the meat flavour was lost. The meat was just a bit on the rare side, I would have liked it a little bit more cooked and for the pork probably the rarest I have ever served and had. Funny enough, they tasted quite similar and if given a blind test I could not tell which was which. Copita Del Mercado was a disappointment, the food was average, the wine was terrible and the service didn't tick the box. If it wasn't for the soft launch, I wouldn't have come. Who knows, maybe Copita will tell a different story. Hopefully, a better story. 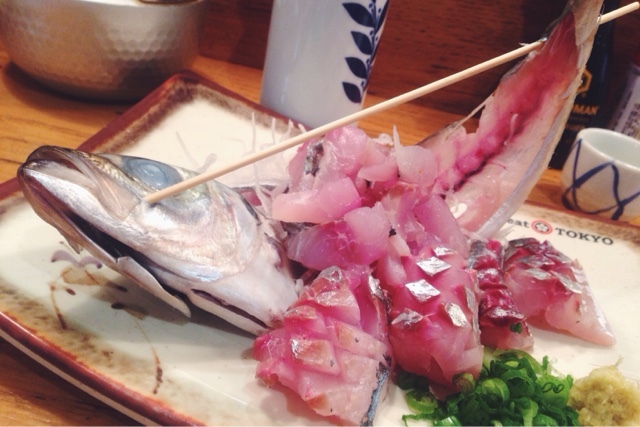 It is always assumed that you can't have good quality Japanese food in London without paying a hefty price tag. Well let me show you to this little Japanese gem. I heard many good reviews online and from friends about Eat Tokyo, but always felt a bit skeptical. During one Sunday lunch time, we decided to pay a visit despite changing the reservation several times. 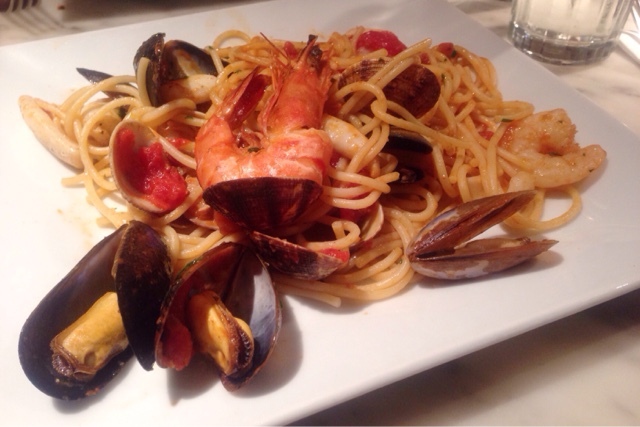 Best to make a reservation beforehand, as it is a small restaurant and can get very busy at night with long queues. We was seated at the bar table over looking the chef's actions. Looking at the extensive menu, you would tried to order everything. From sushi, to noodles, to donburi and almost anything you could want. Well they had a special price for certain sashimi during November. What do you do? Of course order sashimi and sake. I'm impressed with the sashimi, wonderfully fresh and delicious. Especially for the price that you are paying, the quality is generally good. 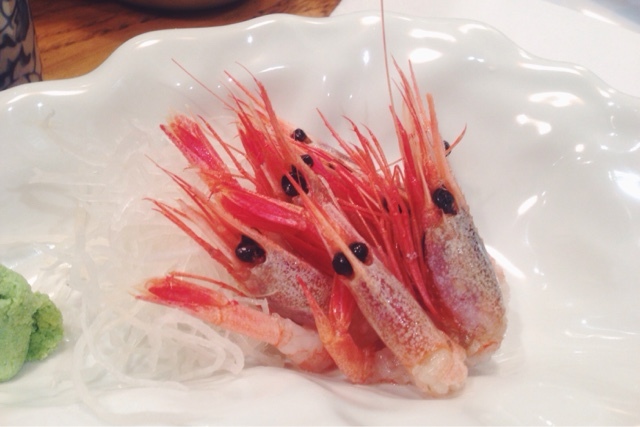 The aki (horse mackerel) was light, the amaebi (sweet shrimp) were decent and the toro (fatty tuna) was silky and not overly fatty with a melt in the mouth texture. The Unagi jyu (grilled eel) was nice, the sauce was sweet and sticky. I was happy to see decent size of unagi, this place certainly doesn't skimped on the portion size. 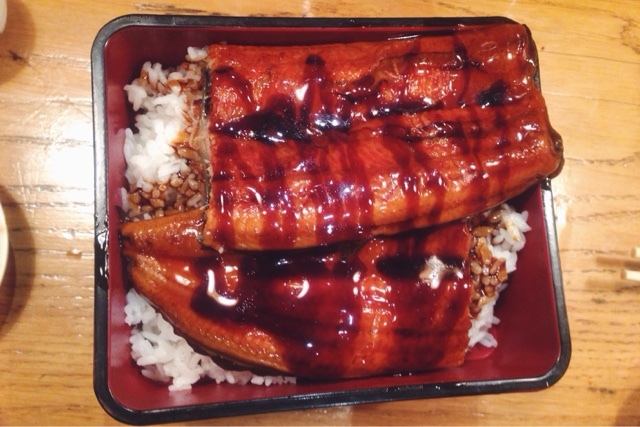 It's not the best Unagi I had, but it is good enough for London for now. For the month of November, with their Trafalgar Square branch being moved to Soho they had a special price of £1 per pieces of Otoro sashimi and £1.20 per pieces for Oo-toro nigiri. Surely no one can resist that price. 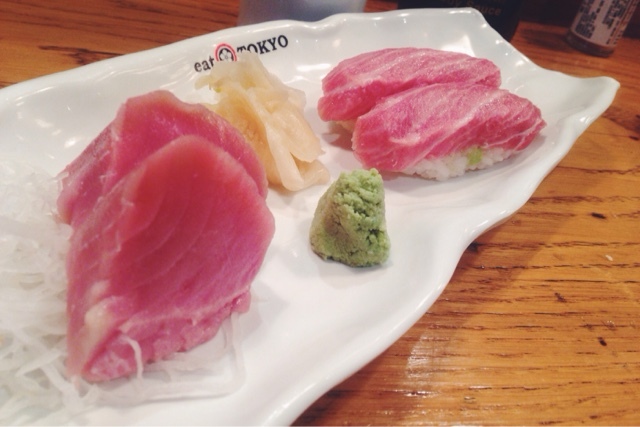 Wish we had ordered more of toro now. 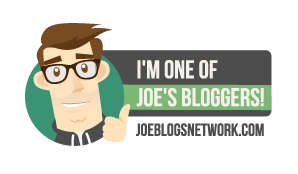 I really enjoyed the food and the service was friendly. Eat Tokyo will never be the awarding food and decor that you are after. But for Japanese food craving, it is definitely the restaurant to go for without splurging the bank that does tasty food. 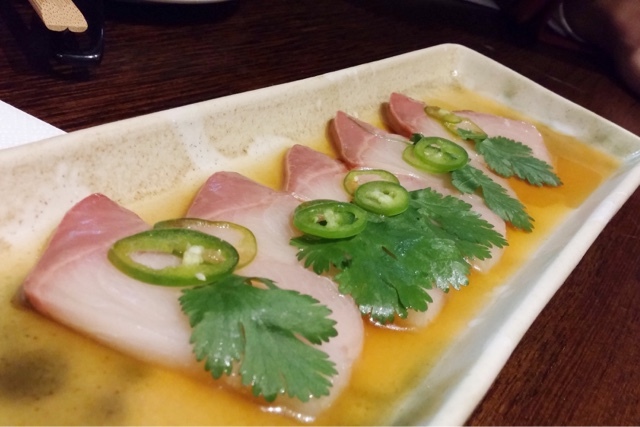 What is so attractive about raw fish marinated in lime juice (ceviche/tiradito)? 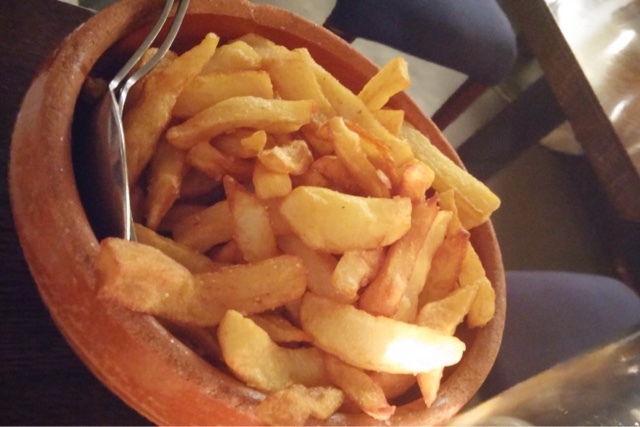 Peruvian food, have you heard of it? Yes? No? Yes? No? It seems to be a big thing at the moment in London, with Lima being the front runner (winning a Michelin star). Whilst I'm writing this, there are probably new Peruvian foodie hangouts opening up, can't keep the pace up at all. 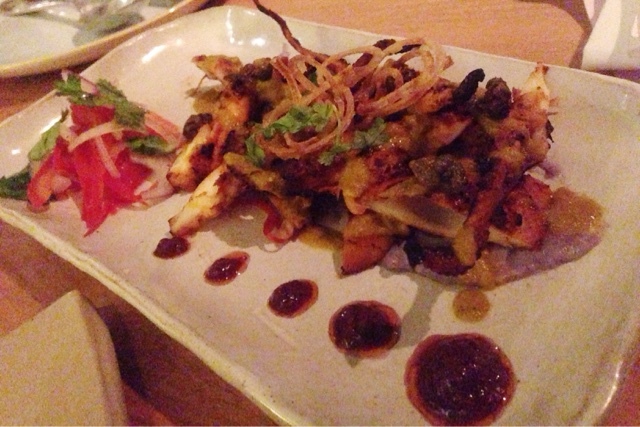 Pachamama described themselves as Peruvian food with a British twist. Already had a glass or two of wine with oysters before walking to Thayer Street, on the end of Marylebone High Street just few minutes walk away from Selfridges. Let's have more cocktails and wine. Started of with a Mama's Pisco, made up of pisco, fresh raspberry, mint, orange juice which was very refreshing. Mrs T had Papa's Pisco, a mixed of pisco, lime, egg white, Amargo Chuncho. To go with our a meal, we ordered a bottle of El Muro Macabeo, Spain 2013, their house white wine. 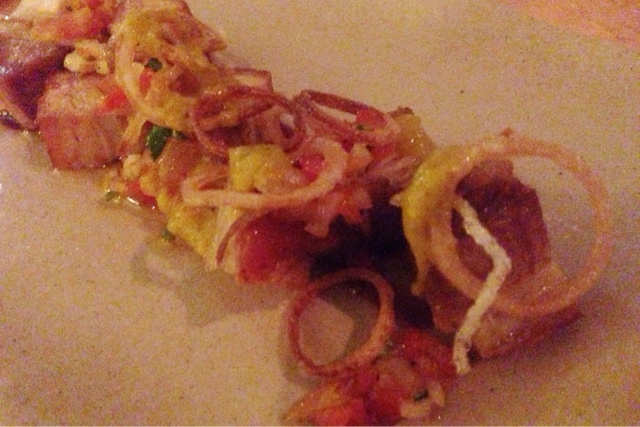 Chicharrónes came as a nibbling dish recommended by the waiter. 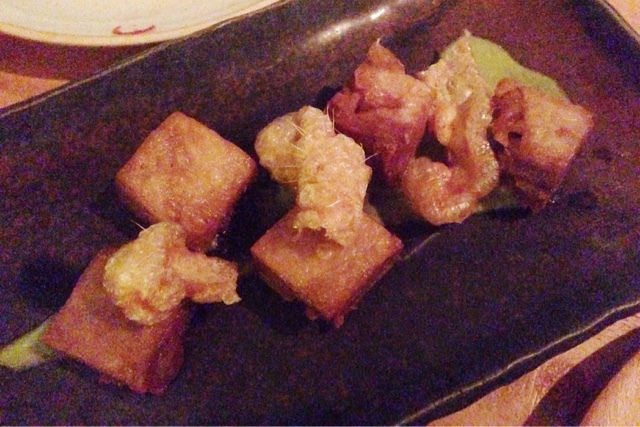 It's deep fried pork rinds with pork belly. A nice start to the evening. Mama's ceviche caught our eyes on the menu. I love raw fish, Mr T loves raw fish and so does Mrs T. I don't know what traditional ceviche taste like. I had sashimi many times but not ceviche. You probably will be wondering what's "tiger's milk", is it actually tiger's milk? Believe me not, I thought the same. Leche de tigre, or tiger's milk is the Peruvian term for the citrus-based marinade that cures the seafood in a ceviche dish. 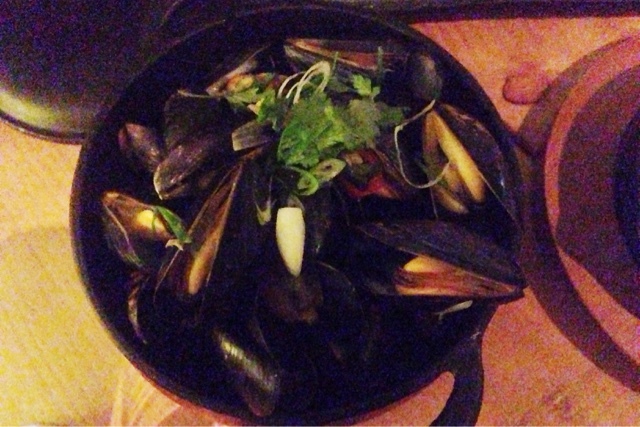 We ordered three different kinds, bear in mind one of the dish was non seafood. Everyone loves mushrooms, but this mushroom dish is so easily forgotten that one can skip it. 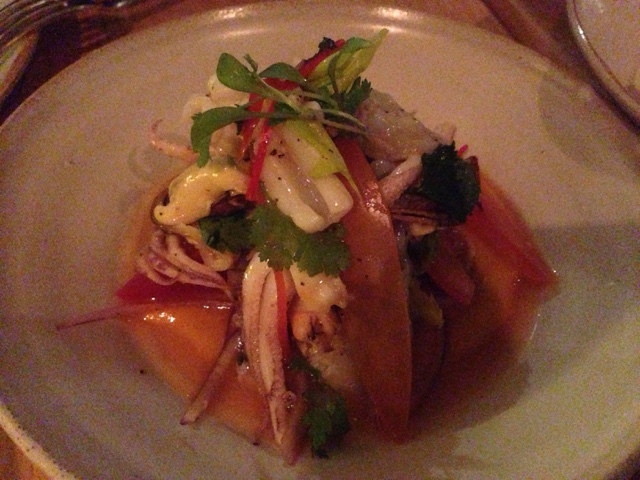 The sea bass was delightfully fresh with a crunchy sweet potato against the soft fish. The clear winner was the squid, prawns and mussel swimming in a pool of devil's milk was just full of flavour, fresh and zesty. You can easily be ordering all the raw dishes, but the food doesn't stop there. What was supposed to be lamb belly was sold out already, thus it was replaced with duck belly. 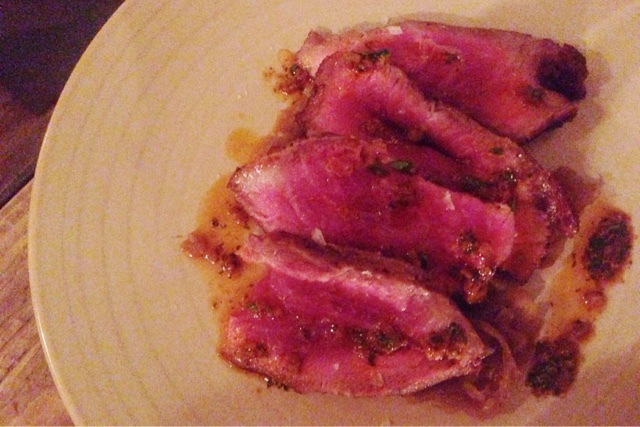 The meat was tender with a crispy layer and good compliment of green aji sauce (no idea what it is). The rib-eye is a big disappointment, the meat was tender but the dish can easily be passed as a stir-fry beef from a Chinese takeaway. The Peruvian inspiration has definitely been lost on its way. The mussels really took us for a surprised, it was fat, juicy and probably one of the biggest size of mussels you have ever seen. With all the consumption of meats and seafood, it's easy not to order vegetables. The flamed octopus and veal heart was a great success, the smokiness from the grill against the sweet purée and moreish. 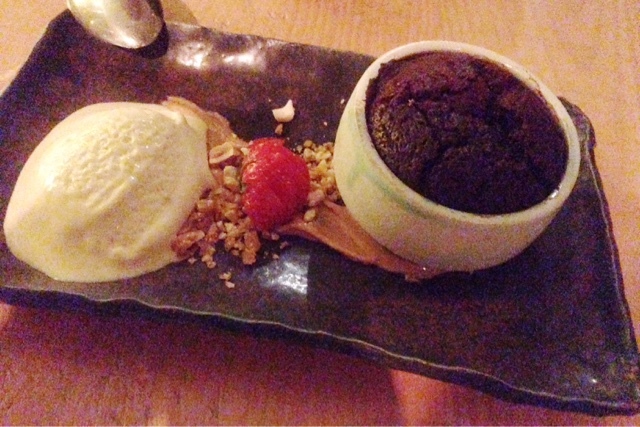 It disappeared fairly quick with the vegetables still remaining to be eaten before entering the dessert world. The vegetable dish is actually good, it maintains its crunch bar the squash (squash cannot be crunchy) and seasoned nicely. By this point, there was barely any room left for dessert. We ordered and we emptied the plate. 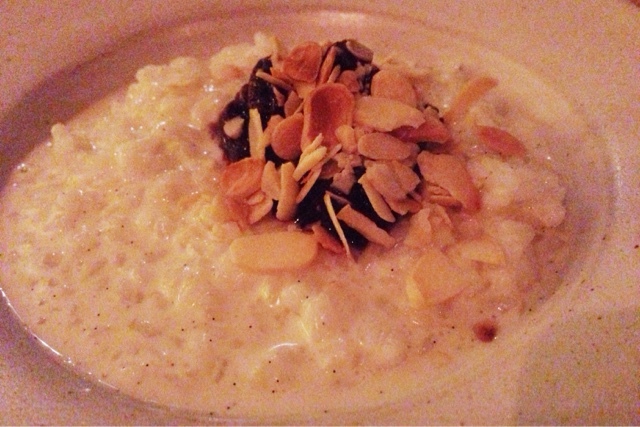 The rice pudding was creamy and sticky, with a sweet note from the quince and the crunchiness from the toasted almonds all worked nicely. I would have been more impressed from the fondant if it was turned out from the ramekin which would have shown the skills of the chef. Nevertheless, it wasn't the most prefect fondant but still had all the quality of it. From the other guests, they were more impressed with the ice cream, intensely peanuty, smooth, salty, rich. The perfect combination, to mellow richness of the fondant. 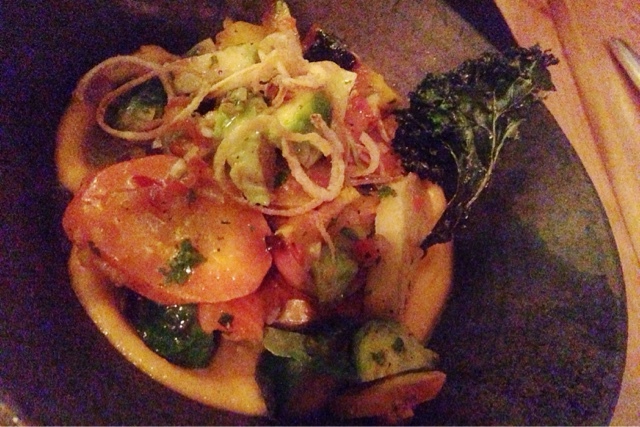 Despite the flaws and inconsistency, I loved the food at Pachamama. 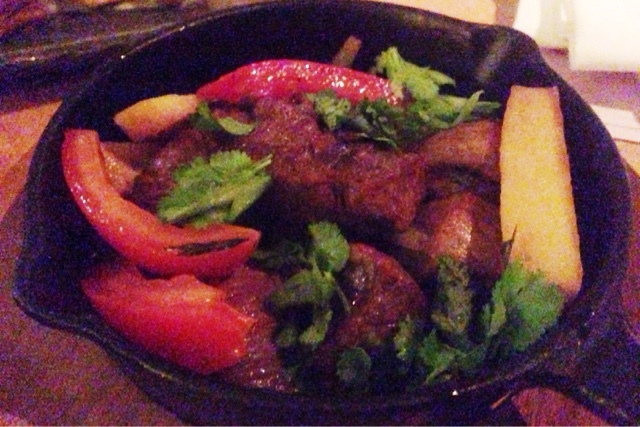 You will be disappointed if you want authentic Peruvian food as there seems to be influence from all over the world. It's an all rounded good fusion menu that I will be returning if I can get a table. Apparently they have live DJ playing at the restaurant, not that I remembered. But then I was drenched in rain that night and I have to apologise for the poor quality of the photos, it was dark in the restaurant and I only have a insufficient iPhone 5 to use.